Swathed in a sea of slate toned mist, the Blue Mountains are renowned for their extraordinarily pristine rocky outcrops and dense, seemingly infinite green canopies. Should you take a day trip to the blue mountains by train, you'll find yourself sitting atop tracks that seem to hover over a vast blanket of hazy green peaks and valleys. The Blue Mountains is like no other earthly terrain and is an absolute must-see for those visiting Sydney. 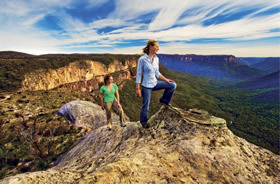 The best Blue Mountains tours depart from Sydney and take visitors through the once impenetrable mountainscape to the Three Sisters limestone formation. An indigenous dream-time legend tells the story of three beautiful sisters from the Katoomba tribe, 'Meehni', 'Wimlah' and 'Gunnedoo'. Falling in love with three brothers from the neighbouring Nepean tribe, there were forbidden to marry due to tribal law. The brothers went into battle with the Katoomba tribe who asked a witchdoctor to protect the sisters by turning them to stone. Unfortunately, the witchdoctor died in battle before he had the opportunity to reverse the spell and the sisters have sat overlooking echo point ever since. Blue Mountains tours from Sydney will continue on to the Jenolan Caves with the opportunity to experience the Skyway Cable Car and historic Scenic Railway nearby. Any good Blue Mountains day trip itinerary should also include a journey into the surrounding native Australian bushland. With the opportunity to see wild kangaroos, kookaburras and parrots up close, the tour should take you through to the Jamieson Valley, Wentworth Falls and the remarkable Grovett Leap lookout. Tours will include expert commentary and experienced drivers, ensuring your visit to the Blue Mountains is totally safe and fulfilling.